I Inherited A Las Vegas House, What Can I Do With It? I’ve Inherited A Las Vegas House, What Can I Do With It? With utmost respect and condolences. This can be a very challenging time for many reasons, and dealing with property ownership is tough at the best of times. Are you saying to yourself, “I’ve inherited a house, what can I do with it?” Should I rent it? Should I sell it? How should I sell it? There are many options available for you, however, we can help. We’re experience home buyers here in Las Vegas, and we buy several houses each month in the Las Vegas, Nevada area. Each and every month we get calls from those who have inherited a house and are looking to sell the house……we’ve provided a list of things that you need to consider. 2) The investment is only as good as the property manager. If you don’t want to deal with making repairs, updating kitchens, improving landscaping and overall cleanup, don’t worry. We buy Las Vegas Houses for cash, as-is. 5) If the market continues to appreciate faster than your other options, hang on to the investment. 6) Uncle Sam will always want a piece of the action. 7) Compare a few scenarios. We’ll help you determine prices for any property in Las Vegas – if you sold it today without doing any work, the highest price the market will bear, and the projected value of keeping it as a rental (along with the costs). 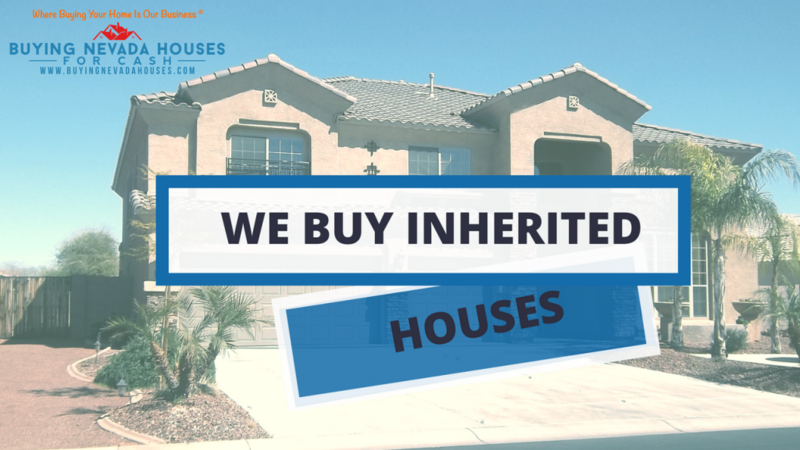 Just call or text us today at (702) 583-7824 or simply fill out the form below so that we can make you a fair cash offer on your inherited house today!